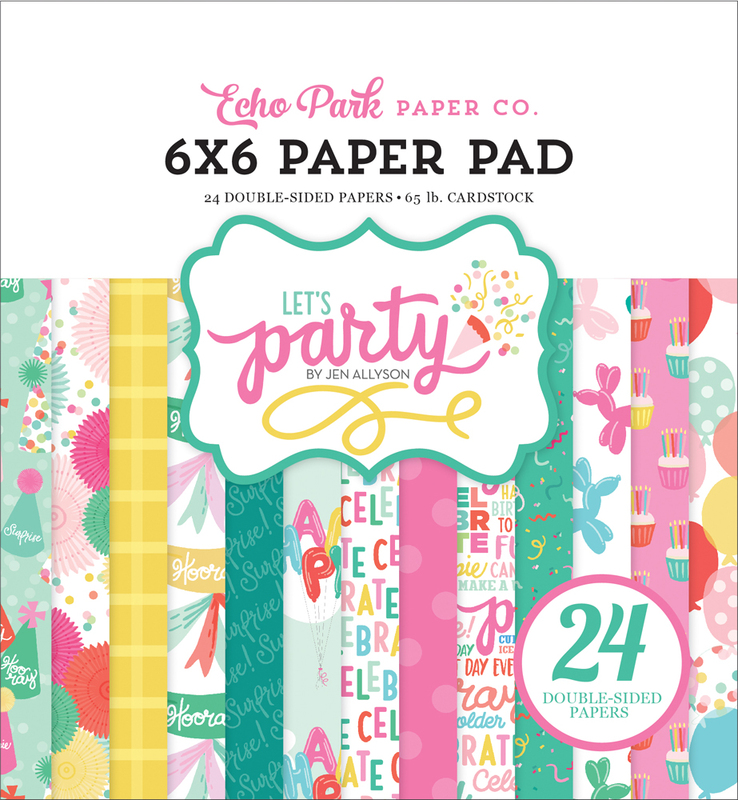 Click here to shop Echo Park Paper die cut shapes and print and cut shapes. Click the link to shop our latest digital products. Click here to shop Carta Bella Paper die cut shapes and print and cut shapes. It’s my party and I’ll scrapbook if I want to. Scrapbooking is a party in its own right, wouldn’t you say? 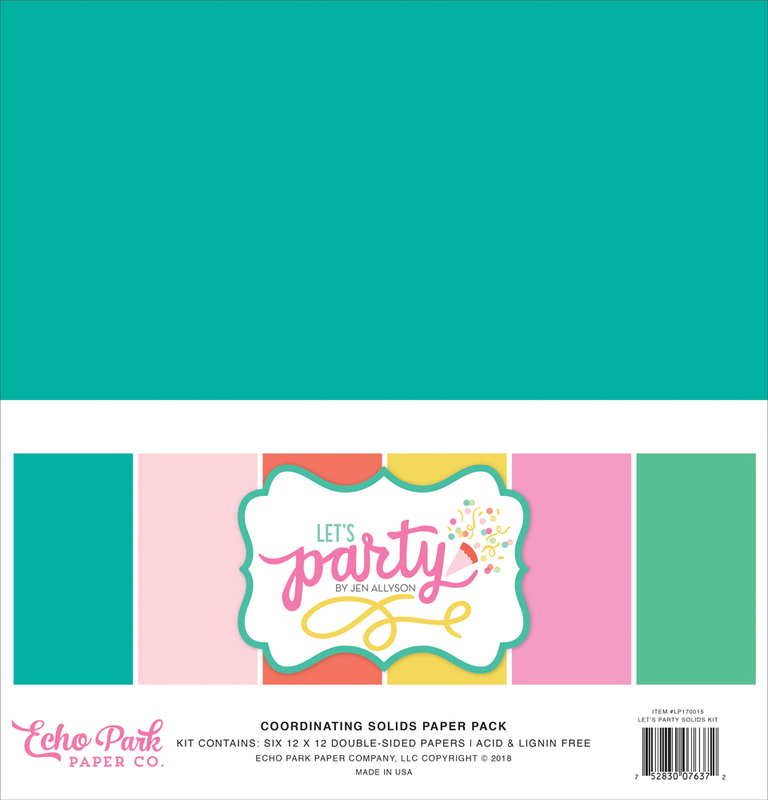 And Echo Park’s Let’s Party collection makes such a celebration a vibrant and happy one. 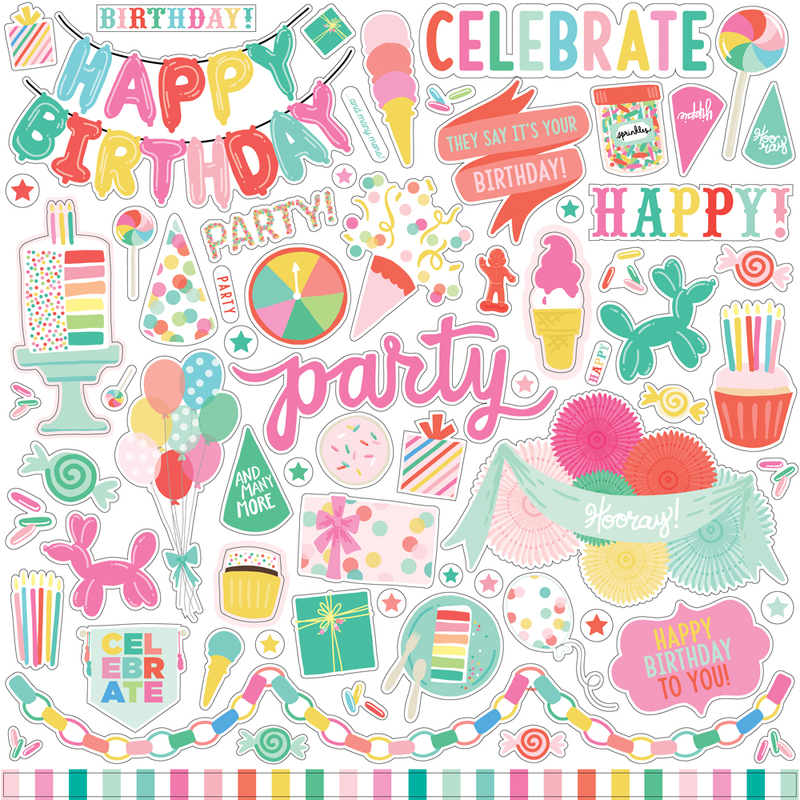 With motifs including birthday cakes, balloon animals, confetti, and more, it’s impossible to avoid that festive feeling. Inspired by this lively collection, I made a bitty paper chain from 1/8” x 1” strips, which I cut from the Let’s Party Solids cardstock. It’s a fun way to give a scrapbook page or birthday card a little 3D boost. Using leftover chain bits, I added falling confetti to my design. You could also do this with holes punched from your basic hole punch. Bake a paper cake using striped paper, cut into rectangles. Inspired by the birthday girl’s candy cake, I gave this one a little tasty styling of its own. Do you ever find yourself making a complete 180 in the middle of a project? Or at least a rather drastic departure? It sure happens to me. I’ll have a specific vision in mind, but, as it comes together, I decide to mix things up. Wouldn’t you know it? That’s what happened to me with this page. I couldn’t put my finger on it, but I was wasn’t fully feeling my original green/yellow combo. So I looked to the pretty birthday girl for inspiration. Being the girly-girlI she is, I decided to switch my colors up. I feel the pink/white combo more closely complements this cutie. While it’s sometimes stressful to put the brakes on mid-project, doing so can actually be a fun part of the process. Don’t hesitate to explore options until you land on a look you love.